Home / Futon Mattress Choice / Tri Fold Futon Mattresses for 2 seat futon sofa beds. The standard futon mattress suitable for the original ‘A’ frame style pine futon sofa beds or modern hardwood or metal frame two seat or single chair futons. 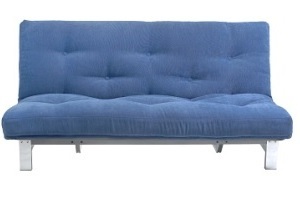 This is the original, great dual purpose futon mattress. Available in a choice of sizes, the Tri-Fold Futon mattresses are perfect to use on traditional Pine 'A'-Frame futon bases and hardwood or metal two seat futon sofa beds. Ideal for both sitting and sleeping and available as a six-layer futon mattress, hand made, like all our futons, down here in Devon using a top and bottom layer of pure lambswool, three layers of woolfelt and a central layer of rebound polyster ensuring that these futon mattresses are both comfortable and durable. These excellent futons are upholstered in a hard wearing 100% cotton drill fabric in a colour of your choice, with the option of an additional loose fit cover for easy care and cleaning. 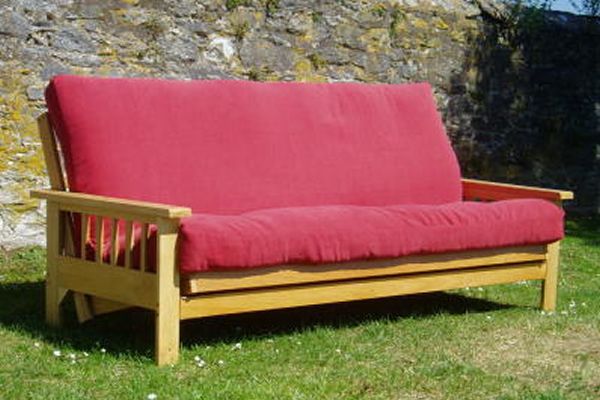 Hand made in Devon 6-layer futon mattress for two seat futon sofa beds. Choice of sizes from single beds to kingsize. Covered in a tough cotton fabric and filled with quality selected fillings. All our 'Tri-Fold' futon mattresses are around 15 cm thick when new. Suitable for traditional pine 'A'-frame futons and hardwood or metal 2 seat futon frames, please call us if you are unsure of your requirements. 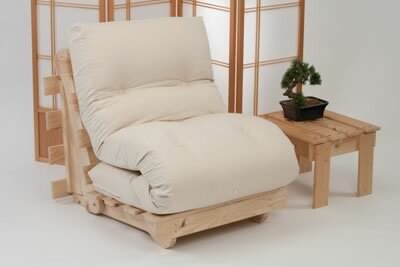 All 'Tri-fold' futons are in stock. (Mainland UK all sizes £Free).